My kids love Top Chef. It is one of their favorite shows on television. It is hard for me to put myself in their shoes – when I was their age I was watching Little House on the Prairie. The only cooking shows were on PBS, and I don’t think there were many to choose from. Today with DVRs, On Demand, and the Internet, you can basically watch any show you want whenever you want. Life is very different – and my children take full advantage of the choices available. Tonight is the season finale of Top Chef, but since we rarely watch a show when it actually is aired – I am sitting here typing this blog post – while they are finishing their homework. Hopefully this weekend we will see who wins, if we don’t find out beforehand. So why are my kids so fascinated with Top Chef? Well, I think for many reasons. They love a good competition. They love finding out what the challenges are. And they love Padma and Tom. But seriously, who doesn’t? I don’t know a lot of famous people – meaning, if I saw Tom Hanks walking down the street – I would never know. But get a celebrity chef – even just a local chef near me, and I know exactly who they are. I have seen quite a few over the years, but have never met Tom. He is one of the good guys – I really respect him as a chef and as a person – especially after reading my brother-in-laws interview with him. I loved it. 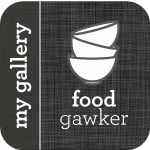 I feel exactly the same way about my food – and I spend a lot of time getting my food from the places I feel good about. And yes, I avoid hormone and antibiotics in my food any way that I can. One of my favorite foods is bacon. I have mentioned this many times before – but I am not sure I have mentioned where I get my bacon. Skagit River Ranch has just about the best bacon in the world (in my opinion). I have to go to the Farmer’s market to buy it – but let me tell you – it is absolutely worth it. I don’t know what they do to their bacon, but it is salty yet sweet, and really meaty. So of course when I saw this recipe in Food & Wine, I knew exactly where the bacon was coming from. This salad was outstanding. 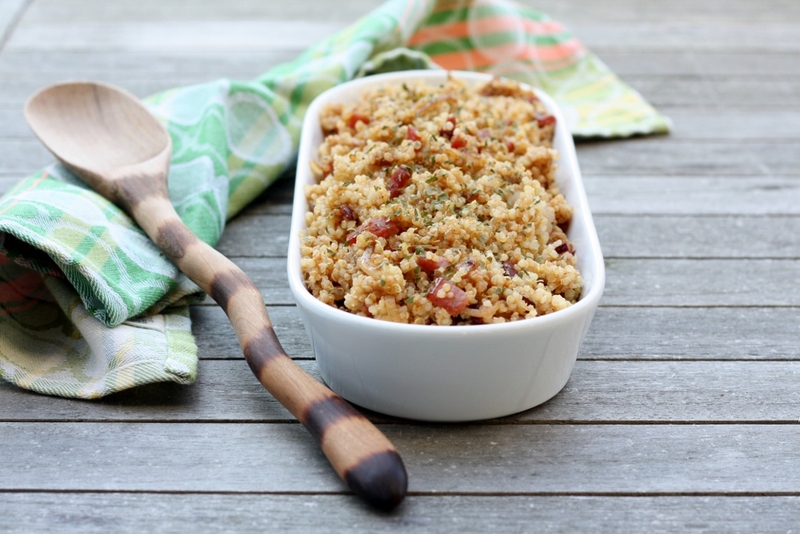 I love quinoa, and the bacon and caramelized shallots were a delicious combination with the nutty grain. I adapted the recipe slightly below, but feel free to add even more ingredients – like a nutty green soy bean that I am thinking of…that goes perfectly with bacon. So for those of you watching Top Chef tonight – I hope the best chef wins, and their life if filled with perfectly smoked bacon that is antibiotic and hormone-free. Combine the quinoa, water and salt in a medium saucepan. Bring the water to a boil, and after the water begins to boil, reduce the heat to low and cover the pan. Gently simmer, covered, for 15 minutes (there may still be some water not yet absorbed). Remove from heat. Keeping the pan covered, let it stand for 5 minutes, or until the remaining water is absorbed. Remove the lid and gently fluff the quinoa. Set aside to cool. Crisp the bacon, drain and cut into 1-inch pieces. Set aside reserving one tablespoon of the grease. Sauté the shallots in the bacon grease, then set aside. In a bowl, whisk together the olive oil, balsamic vinegar, mustard, brown sugar, smoked paprika, chipotle, salt and pepper. Set aside. In a large bowl, toss together the cooked quinoa, bacon pieces, shallots and parsley. Toss with the dressing and serve at room temperature or chilled. Never thought of cooking quinoa this way and I have NO idea why! This sounds amazing – what a great way to liven up such a beautiful ingredient. I am with you, I might not be able to spot a famous actor in the streets of HK but you bet your bottom dollar if I seen a fellow blogger or famous foodie I could spot them from miles away. This sounds like a delicious little dish.